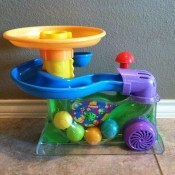 When our little girl was a year old, he played with the Ball Popper at a cousin’s house and simply did not want to put it away. Normally she will get bored of a toy quickly and move on to the next thing. Not so with this one. 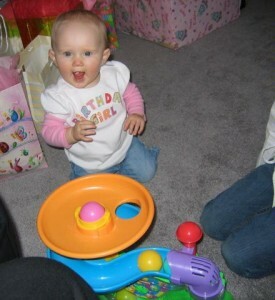 For her birthday, we bought one, and everytime she starts playing with it, her face lights up, she squeals with delight when she presses the big red ball to start the action, and then once the balls start popping in the air, she is overjoyed. Words cannot describe her excitement. The five colorful balls are placed in the chute at the top of the unit, then as they roll down the ramp, the air popper forces them up through the top hole and they pop around like popcorn! 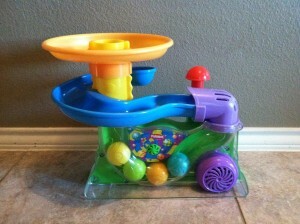 We enjoy watching our daughter laugh and play with the Playskool Busy Ball Popper, but she is learning from it as well. She learned cause and effect when pushing the red lever to start the machine. She discovered that the music will not start until the balls begin moving. She also learned where to place the balls, and how to catch them if they scooted away, and finally she learned words like “ball”, “stop”, “out”, “play”, and “dance” just from the repetition of the activities. The fun music is like a circus parade and several songs play randomly while the popper is on. Storing is a piece of cake since it’s heavy enough to stay upright while playing and light enough to grab and go when playtime is over. There are three main pieces that an adult has to screw together, and though a child might be able to take off the top piece if they work enough at it, it easily snaps back into place. Just don’t lift it from the top piece and you won’t have any problems. 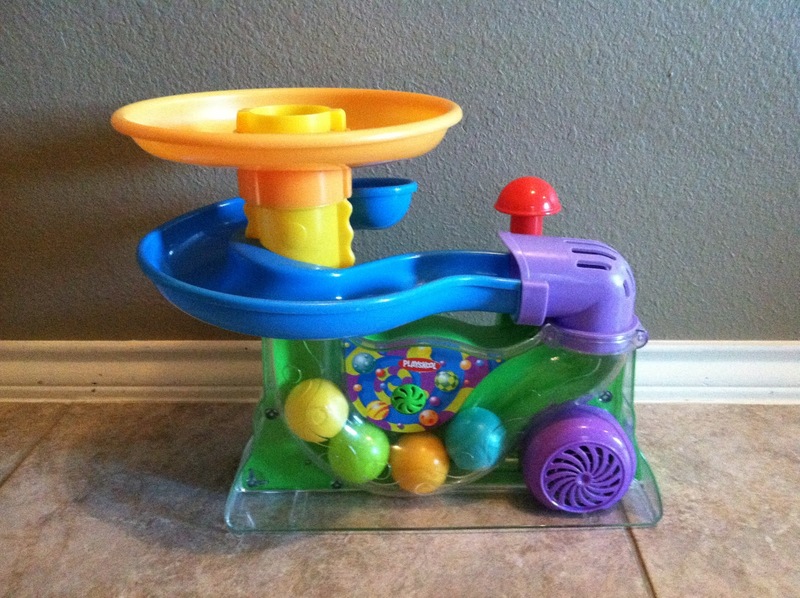 I highly recommend this toy for babies who are able to sit up unassisted so that an adult can help them play with the balls as well as walking toddlers since they will love chasing the balls. It’s at a great price range for a baby shower gift.